With its delightfully obscure title, Yuki Onodera’s first body of work certainly doesn’t offer much insight into what each photograph actually is. In 1991, the young photographer entered her series You Are Running. I’m Waiting with Ears Like Dumbo’s to the very first New Cosmos Photography Award in Japan. Praised for its “mysteriously eerie quality,” this was the winning submission; a collection of black and white images of bare rooms, superimposed with hazy traces of manipulation. Is this wavering orb a disk of the sun or a coffee cup imprint left behind? Slices of moons transition through their phases and windows warble in a blur of vibrations. Jacques Derrida once claimed that there is no such thing as a “pure, unblemished meaning or experience.” Onodera’s images are certainly blemished. Faintly familiar vestiges of the world we know are tainted with her touch, shifting our focus away from the object represented towards the conditions of its representation. Her later series, The Bee-The Mirror (2002) shows an apartment filtered through multiple layers of perception. Taken in the middle of the night while holding a flashlight in one hand, scenes from the apartment are reflected in a mirror, caught from the “perspective” of a wandering bee. This time, Onodera isn’t just looking through the camera at the world. She is looking through the camera, through a bee’s vision, through a mirror at the world. Added to this complex mesh of vision, a flashlight is needed to actually see the world lingering behind the darkness, impenetrable to the mere eye. With its final fold of entanglement, this is actually a reversal of the world, a mirrored image. Perhaps when we look at a photograph we shouldn’t be asking what it is but rather, who it is? Returning to Onodera’s first series, these images can be seen as a remembered experience, a passing of time spent waiting for somebody to return, where time, vision and sound are all fused into a similar mesh of incomprehensible layers. 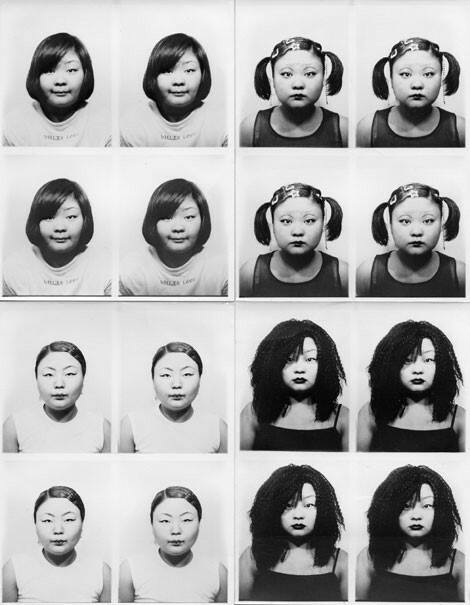 Perhaps inspired by the photobooth, or “purikura,” trend of the 90s, Tomoko Sawada turns her own lens upon herself, questioning directly the source of this experience. Her works explore the tensions between outer image and inner feeling, using her own body to create a variety of different identities. Her series ID400 (1998-2001) is the most evocative of this, an extensive collection of ID photo images that show her dressed up in different guises, transformed into a multitude of different personae. This form of official visual documentation is integral to our identity, yet in showing how easily they can be manipulated to show somebody else, we begin to wonder at their true authority. Mikiko Hara’s images document strangers wandering through the city, particularly women. Yet her ambiguously titled series These Are Days (2014) is as much about her as an observer as it is about the people she captures. Her shadow creeps along the floor of a grocery shop. One woman peers directly into the camera, watching the photographer watch her, while another looks away, purposefully avoiding Hara’s eyes. Her photography doesn’t speak about herself directly, but her presence is entrenched within the frame, inseparable entirely from the image itself.